Apheresis Equipment Market size was USD 1.7 billion in 2015, with 11.4% CAGR estimation from 2016 to 2024. Rising prevalence of chronic diseases, growing number of platelet donors and increasing R&D investments from biopharmaceutical companies will drive global apheresis equipment market size. Increasing geriatric population base, escalating number of casualties leading to rising number of surgical procedures and growing public awareness regarding apheresis blood collection should stimulate apheresis equipment market growth. Growing demand for platelets and plasma due to rising incidence of blood related disorders, coupled with technological advancements should fuel apheresis equipment market growth. According to NHSBT, platelets demand was estimated to grow annually at 3% during 2011 to 2014 while plasma demand exceeded 20 million liters in 2010. Favorable reimbursement policies for apheresis treatment should significantly drive apheresis equipment market share. The U.S. Government actively funds for apheresis research through benefit programs such as Medicare, Medicaid, Veterans health administration, and military and employee insurance programs. Medicare provides coverage for apheresis procedures performed in a hospital as well as in blood centers. 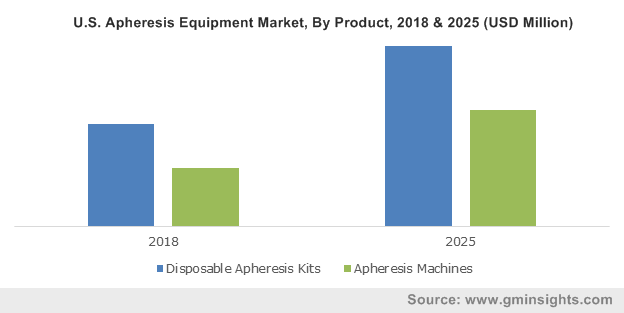 Disposable apheresis kits grabbed over 78% of apheresis equipment market share in 2015, and expected to surpass USD 2,944 million by 2024 due to its growing acceptance and relatively less prices. Apheresis machines which includes membrane filtration and centrifugation should witness robust 17.1% CAGR from 2016 to 2024 due to increasing need for automated component separation devices. Neurology held over 50% of apheresis equipment market share with over USD 863 million in 2015 witnessing a robust 12.3% CAGR over the forecast period. Indispensable need of therapeutic apheresis for treatment of neurological disorders such as multiple sclerosis and autoimmune disorders should drive the segment growth. Plasmapheresis attributed for over 54% of apheresis equipment market share in 2015 and anticipated to exceed USD 2,152 million by 2024. Rising incidence of cardiovascular disorders coupled with growing demand for plasma derived therapies should propel plasmapheresis segment growth. U.S. led regional apheresis equipment market share with over 87% in 2015 and estimated to exceed USD 1,524 million by 2024. Growing demand for technologically advanced and automated products coupled with favorable reimbursement policies, and better access to advanced healthcare will drive business growth. Europe apheresis equipment market size was over USD 365 million in 2015 and expected to surpass 1,084 million by 2024 owing to presence of less stringent apheresis devices approval regulations and availability of large untapped opportunities in emerging European countries. APAC apheresis equipment market size was valued over USD 412 million in 2015, with expectations to surpass USD 1,265 million by 2024. Rising prevalence of blood disorders in emerging markets of India and China should stimulate global apheresis equipment market share. Furthermore, improving healthcare infrastructure and rising number of healthcare practitioners should offer lucrative growth platform in this region. Global apheresis equipment market share was dominated by large corporations such as Terumo, Fresenius Kabi, Haemonetics and B.Braun Melsungen. The industry is oligopolistic in nature, marked by significant number of mergers and acquisitions and strategic collaborations. Emerging countries such as China, India, and Brazil hold high future growth opportunities, hence industry participants are striving to increase their presence in these lucrative markets. The other notable industry participants include Fenwal, Therakos, Hemacare Corporation and Kawasumi Laboratories. The apheresis equipment market size is likely to face limitations in term of risks associated with apheresis procedures and lack of donor availability and histocompatibilty. Additionally, high apheresis procedure costs coupled with lack of favorable reimbursement framework in certain countries is likely to slower market penetration rates in some underdeveloped and few emerging markets. Several public and private insurers have recently begun to examine apheresis procedures reimbursement coverage. However, many private insurers such as the Pacific Mutual and Prudential provide coverage for apheresis procedures regardless of whether they are conducted in a hospital or elsewhere. Similar policy related reforms are implemented in other countries and insurers are forming consensus on wide coverage of diseases. Presence of such favorable reimbursement policy structures especially in the developed markets are expected to drive global apheresis equipment market growth. Strategic alliances, mergers and acquisitions and new product development are some of the sustainability strategies adopted by the key industry players. Advanced technological innovations are aimed at delivering effective and faster results. Automated interface systems and GUI displays reduces human intervention and improves their adoption rates thus spurring apheresis equipment industry growth.